It's up to the person who's posting the pic's to change the settings in their User CP. oh, now it all comes together! Last edited by Adam M; 16 April 2004 at 02:59 PM. Visit Brian the [email protected]'s homepage! can anyone see my pictures above? or is it just me? LOL peccy i can see your pics now, ive just been to my control panel and turned on IMG pics, it enables your to see IMG pics when you post !! So if peeps link the pic with a [img] [/img] we can see the pics !!!! LOL so easy hey !! Scoobynet is Great Again LOL !!! still dont get it, i have mine clicked for images, i can see peccy perfectly clearly, but cant see my own. should we be using the [img] command or the [url]? checked and confirmed, i think it may be fotopic then, anyone fancy hosting some of mine? i think it may be fotopic then, anyone fancy hosting some of mine? I bought some superleggeras in anthracite for my type r but i'm not sure whether to fit them or stick with the gold. What do you think? Another vote for the gold here. Gold is much better with the Blue car. However, the OZ wheels look better (less spokes) than your other ones. A refurb of all four in Gold would be under £200.00. Last edited by SUBTYPER; 26 April 2004 at 01:31 AM. folks, my beloved type R is now for sale please have a look and bid on the bargain of the year! Last edited by floppy dave; 26 April 2004 at 12:47 PM. Guys , sorry to say goodbye but this mail is just to advise that my baby is now extremely reluctantly up for sale! MY99 STI Version 5 Type R.
Mint Condition. Extensive History. Only 1 owner. Further info and photos available on request. Sorry to hear that 5. Ive had a few offers on mine lately, but I bet when I do decide to sell, onone will actually have the money! Yeah , very sad to say goodbye. Someones gonna get an absolute dream car. So many dodgy examples about , this one just stands out from the crowd. I would like to think i would get some good interest from Scoobynet as its a mighty fine example and i would prefer it to go to an enthusiast due to its pedigree. available from end of June, sensible offers considered, with or without mods, i have all the standard parts. See page one of this thread for the spec. i will take new photos once i get my digital camera. 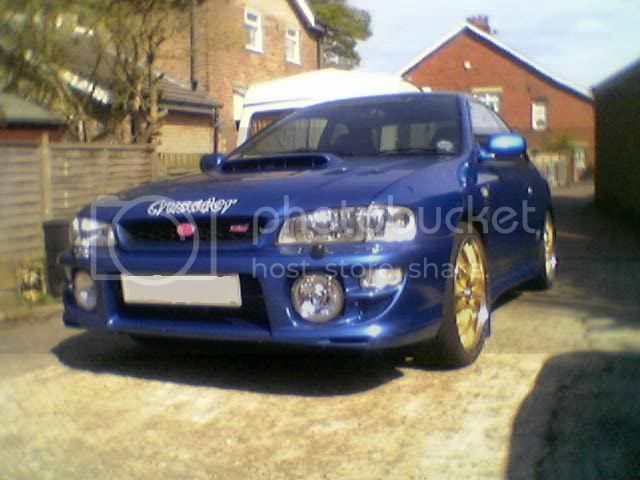 a well looked after example of the finest model impreza!! Last edited by cactus jim; 07 May 2004 at 06:26 PM. one thing i have noticed, a distinct lack of type R's at Scooby shootout. I only counted a couple this year and none last year. good luck to Peccy and Christian, go get em! !